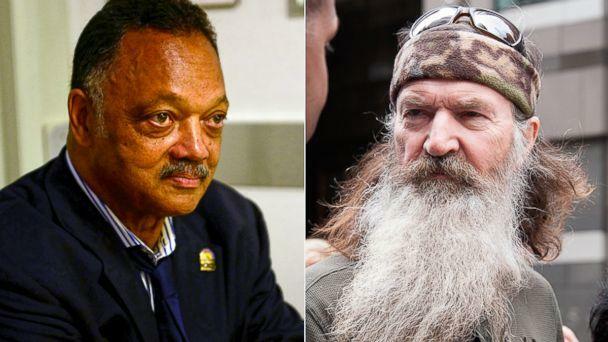 Jesse Jackson has decided to weigh in on the inflammatory comments that Phil Robertson made to GQ about gays and African Americans. In an interview with Drew Magary, the "Duck Dynasty" star said the Nazis needed Jesus, that he never saw the mistreatment of African Americans while growing up in Louisiana before the civil rights era and that homosexuality was a sin. A&E has already suspended Robertson, but Reverend Jackson, his Rainbow PUSH Coalition and GLAAD are demanding to meet with network execs, along with Cracker Barrel's CEO, to discuss the future of all "Duck Dynasty" memorabilia or content. "These statements uttered by Robertson are more offensive than the bus driver in Montgomery, Alabama, more than 59 years ago," Jackson said in a statement obtained by ABC News. "At least the bus driver, who ordered Rosa Parks to surrender her seat to a white person, was following state law. Robertson's statements were uttered freely and openly without cover of the law, within a context of what he seemed to believe was 'white privilege.'" The release, dated Dec. 23, requests a meeting within 72 hours with A&E and Cracker Barrel execs and urges the network to uphold Robertson's suspension. Jackson and GLAAD said they believe it's not right for a personality with such a large platform to benefit from such comments. On Sunday, Robertson defended his comments about gays and blacks to a small Bible study group in West Monroe, La. "I will not give or back off from my path," he reportedly said Sunday. Robertson added that his GQ comments were quotes from the Bible. "I didn't think much of it at all, but it seems a lot of other people did," he said. EDITOR'S NOTE: ABC is a part owner of the A&E Network"